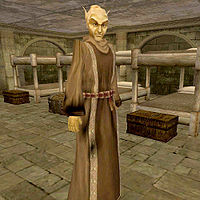 Fanildil is an Altmer healer who works for the Imperial Legion at the Hawkmoth garrison in Ebonheart. There, he sells potions and spells to all who need them, though if you are also a member of the Legion, you must remember to wear your uniform unless you outrank him, or he will refuse to speak to you. This page was last modified on 23 November 2018, at 07:25.